has been sitting abandoned & forlorn! 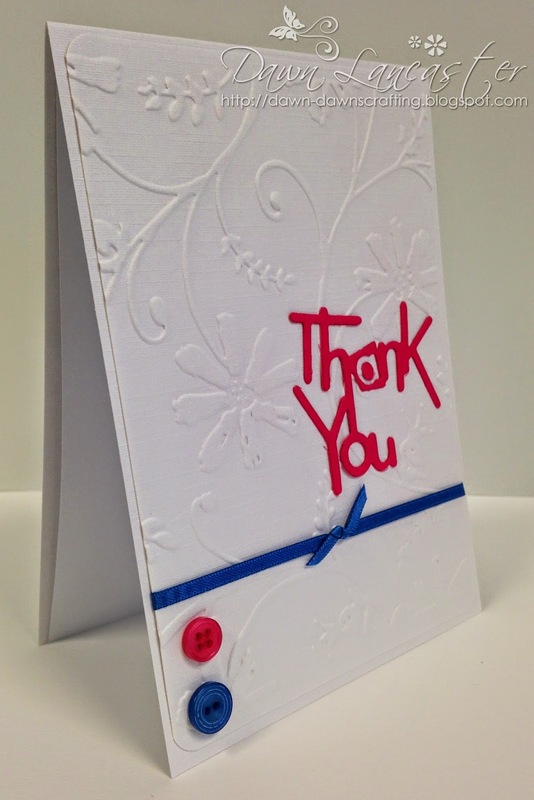 So, here's a little Thank You card I have to share with you today! Inside is a plain insert to write a message on. I'll be doing a bit of blog hopping later to do a bit of catching up! This is a fabulous card Dawn, I love the bright colours against the white background. This is gorgeous Dawn, love the beautiful background and it is a beautiful CAS card. Such a lovely Cas Card! Thanks for sharing with us at A Creative Need! Beautiful CAS card - very classy and elegant. This is 'simply' beautiful Dawn! Thanks for inspiration and Thanks so much for joining us at The Sisterhood’s THANK’ful’ challenge and please come back again soon! Hello, A lovely project, A lovely style. Thank you for joining us this month with our first challenge at A Crafty Mess Good luck. We would love to see you again next month. What a very pretty card!! Thanks for joining us at “Simply Create Too”, hope to see you next time again. Beautiful clean and simple card. A lovely CAS card Dawn. Hey Dawn! I love the white embossed background. The little bit of pop of red and blue is amazing. Nicely done. Thank you so much for joining us over at the DoubleClick Skittles Challenge. Pretty CAS card! Thanks for joining us over at DoubleClick Skittles Challenge! WOW, I love the CAS design, Dawn! Wonderful little pops of color against that beautiful embossed background. Marvelous design! Dawn: Your card is beautiful!!! 'Thank You' from all the Simply Create Too Design members for joining us for this special challenge [Challenge #74 -"Thanksgiving/ Thank You"]. Hope to see your entries next challenge too. Wow, Dawn. Gorgeous card. Love the embossing. Thanks for joining us at the Sisterhood for our "Thankful" challenge. Love the colors and embossing. Thanks for playing with us at DoubleClick Skittles Challenge. 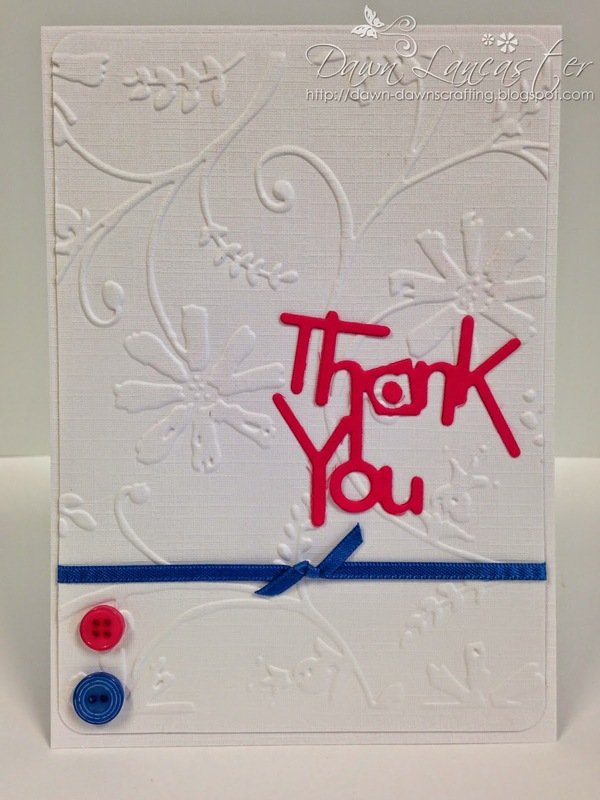 What a lovely embossed thank you note! Thank you for joining the thankful and thoughtful challenge at Dreamweaver Stencils this month.